There is some new thinking in the Bessey Lever Clamps but the traditions of tough, well-made tools continue. 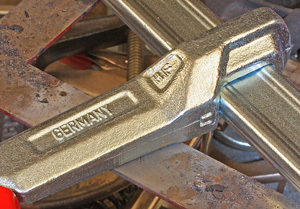 Long one of the world’s leading producers of clamping solutions the Bessey® Lever Clamp series clearly demonstrates that the tradition remains alive and well. Made in Germany from Bessey-tough materials these clamps are as rugged as they are easy to use. Add a good mix of thoughtful engineering and careful manufacturing and the Bessey® Lever Clamps make working in our shops a bit easier. The Bessey® Lever Clamps are built around the familiar and super-tough Bessey hourglass-shaped bar. This design has performed so well for decades that it remains virtually unchanged. What remains remarkable about this bar is the rigidity that can be obtained from such a slim bar through the use of high-end steels and sophisticated heat-treating. That means you have less mass to carry around which makes using the Bessey® Lever Clamps in your shop just that much easier. The moveable arm is precisely forged and tempered to withstand the sizeable clamping pressures the Bessey® Lever Clamps can produce. The one-piece arm includes the beefed up collar that encircles the bar to develop the slip resisting grip when pressure is applied. Yet, the design of this collar makes repositioning the moveable arm fast and easy. The Lever Clamps are built around the familiar Bessey hourglass-shaped bar (left) that works so well the design has been untouched for decades. The one-piece moveable arm (right) is rugged yet can be moved easily up and down the bar. The ratcheting handle that applies the pressure makes the Bessey® Lever Clamps appear simple but look more closely at the mechanism beneath the comfort-smoothed handle and the extent of the engineering is clear. The teeth portion of the ratchet system are machined into the moveable arm and then specially heat-treated to insure durability. The design of these teeth provides positive indexing of the pressure applied while insuring that vibrations will not cause the Bessey® Lever Clamps to release unexpectedly. The actuating handle is large to reduce effort plus shaped and powder coated to be comfortable to the hand. The handle wraps around the mechanism to prevent pinching. An important feature is the oversized pivot pins that the handle and steel floating jaw work on. Bessey apparently wanted to be ultra-sure of these pivots so they were generous with their size and the quality of the material used to make them. Another important and surprisingly heavy component is the rounded cam-like piece that allows the floating jaw to stay put on the material being clamped as the handle is pulled and pressure is applied. This one piece is heavy and precision machined as it must be to have the smoothness of the action that the Bessey® Lever Clamps enjoy. A trigger built into the actuating handle lets you release the clamping pressure easily while maintaining control of the clamp. Like the actuating handle the trigger is designed to be operated without fear of pinching when the pressure releases. 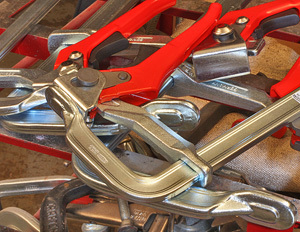 The Bessey® Lever Clamps are available in 6 sizes to cover a vast array of clamping needs. The #LC4 has a 2-3/8” throat depth, a 4” clamping capacity and generates 400-lbs of clamping force. The #LC8 has a 4” throat, 8” clamping capacity and is capable of 660-lbs of clamping force. The #LC12 has a 5-1/2” throat, 12” capacity with 1200-lbs of clamping force. The #LC20 has 4-3/4” of throat, 20” clamping capacity and 1200-lbs of clamping force. The #LC31 also has 4-3/4” of throat but 31” of clamping capacity and 1200-lbs of clamping force. Finally the 1800L12 had 5-1/2” of throat capacity, 10” of clamp capacity and a whopping 1800-lbs of clamping pressure! The operating handle, trigger and ratcheting teeth (left) are all very well made to function without pinching you or requiring large amounts of effort. 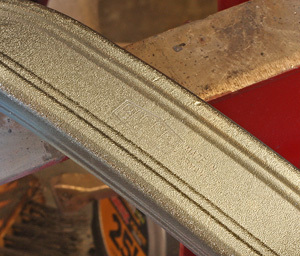 The curved cam (right) is evidence of Bessey's dedication to making a tough tool. This would be much cheaper coming from many other clamp companies. Describing how a Bessey clamp works is easy because I (and probably you) know that it will work very well even before we get to the shop. 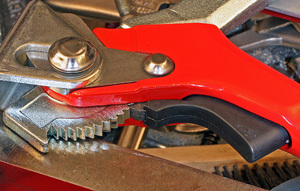 The Bessey® Lever Clamps discussed here continue that tradition without breaking a sweat. Throughout the evaluation I experienced zero problems with the Bessey® Lever Clamps and never found their performance to be lacking. It is important to remember that Bessey is a world leader in designing and producing steel and that gives them a huge Ace in their engineering pocket over nearly all of their competition. They also have few peers in manufacturing with those steels so it is not unreasonable for us to expect the quality and durability that make Bessey tools so popular with so many metal and woodworkers around the world. The Bessey® Lever Clamps are easy to apply to your work and hold fast. The handle is a very fast but dependable way to apply the clamping force needed and then release it easily with one hand. Being able to control the amount of pressure applied is just as important to being able to release it predictably. I often find myself using a clamp to “tweak” a piece into position for welding or other fastening procedures and the lever action here makes that easy to do right. Bessey clamps are seldom considered to be cheap but the people who actually use them are nearly unanimous in consider them one of the better tool values. 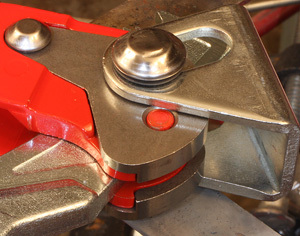 Unless you do something very, very wrong, these Bessey® Lever Clamps will last forever making that a long-term value. The Bessey® Lever Clamps have street prices ranging from $42.00 for the LC4 to $180.00 for the 1800L12 (8-4-2012). Certainly not flea market prices but you buy them once and with a bit of common sense use you will be working with them for the rest of your life. Not a bad deal in my estimation.